(Newser) – Prior to President Trump taking office, Reince Priebus sat down for lunch with nearly a dozen former presidential chiefs of staff. They didn't think much of their successor's chances. "He struck a lot of us as clueless," recalls one. "He doesn't have a prayer," another remembers thinking. 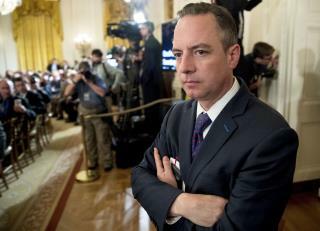 They weren't necessarily wrong; Priebus resigned after just six months on the job. Trump's former chief of staff sat down for a lengthy interview with Vanity Fair to shed light on those six months, which the publication calls "the most incompetent and least accomplished in modern history." Priebus would likely disagree, but he does admit there was chaos during his time at the White House—even more so than previously reported. "Take everything you’ve heard and multiply it by 50,” he says. Someone from the RNC must have been coordinating with the Russians as they attacked state and local election databases. Harthorne, Fake News or a Root Canal without anesthetic? At least you'll know when the root canal is over with. Two things emerge from this Harthorney Fake News: 1. Those who say their replacement 'hasn't got a chance' of succeeding aren't smart enough to know why they are being replaced, and 2. Those who expected the Trump presidency to follow the script of the previous 44 still haven't recovered from the shock. Jesus .....a chicken$hit named Reince is anything BUT a knife fighter. Delusional turd....perfect fit with 2 Scoops.